krismulkey.com: Time to Reinvent Your Life? Time to Reinvent Your Life? Don is one of three people featured in an article called "Time to Reinvent Your Life?" 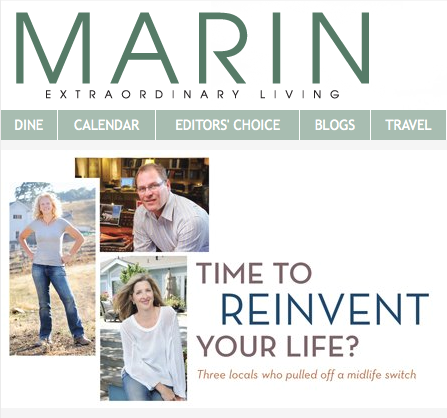 It's in the November issue of Marin Magazine. It's all about crazies like us that started a whole new career later in life. Sheer insanity. Just kidding. If we can do it, anyone can. I'm sure of that now. It's hard to believe it will be three years in November. We still have a long way to go. But we're both amazed at how far we've come. We have a whole new appreciation for small business owners. The beginning of this year was tough on us, like everyone else. We managed to keep all our employees (7) had to reduce hours a bit. But everyone has a job. We have some amazing new clients - including really talented interior designers and some amazing winery owners. And we must be doing something right, because we still work with a lot of the clients that have been using Pollin's for a very long time. It's interesting owning a business that has been around since 1947. There is a lot of history. If you check out our website, don't despair. We've been working on designing a new website for a year. Something always comes up and it gets pushed to the back burner. Never enough time or money. We'll get to it eventually. Last, but certainly not least, we'd like to give a big, huge "Thanks" to everyone that has been there for us over the past three years. Especially my dad. We're really excited about the future. Come visit us in Napa. I know Don would love to have you stop by and say hello.